Britain's Mark Cavendish surrendered the overall lead of the Tour of Britain as Marc de Maar produced a stunning display to win the fifth stage. Cavendish was nearly 12 minutes back as De Maar took his first win in Britain on the 146.9km stage in Stoke-on-Trent. It was a remarkable performance from the Dutch rider, who was on the floor after crashing with 10km remaining. Australian Leigh Howard holds the race leader's gold jersey after finishing in the bunch 15 seconds behind De Maar. It was a tough day in Staffordshire for Team Sky, who saw Cavendish drop out of contention for the overall classification title. The Manxman, who won stages three and four, left Italian Gardens on the Trentham Estate in Stoke with a slender six-second lead over Howard, who won silver in the team pursuit at London 2012. 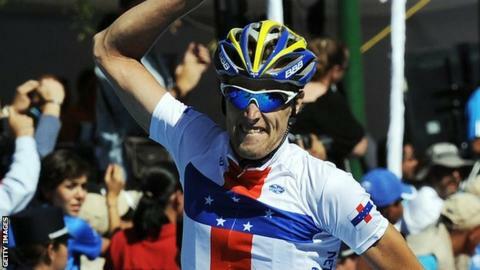 However, the 27-year-old was left behind as a group of 27 riders, including Orica-GreenEDGE rider Howard, made a break. Cavendish's team-mate Bradley Wiggins gave chase, but then dropped back and waited to support his team leader. By then the gap was three minutes and 20 seconds and although Tour de France winner Wiggins did his best to pull his team-mate back to the leaders, they could not eat into the deficit. Team Sky's sports director Servais Knaven said: "At that moment [when Wiggins dropped back] it was the point of no return. "Brad was in between the two groups waiting for Cav and the gap looked shorter than it was. Brad wanted to help us defend the jersey today." De Maar's chances of a stage victory looked all but over when he was among four riders in the breakaway group to crash at a sharp turn with 10km to go. "We thought we would get something different in the fifth stage and we certainly got it: a superstar cyclist shaking things up in the Peak District; an impressive chase; some unusual tactics from Sky; and an unheralded winner. Marc de Maar is Curacao's double road and time trial champion - some cocktail - but this victory is by far the best of his career. Leigh Howard retakes the overall lead but defending it over the next three days of hilly terrain will not be easy for a man who was riding in London's velodrome just a month ago." But the UnitedHealthcare rider was quickly back on his bike and had caught the leaders inside 2km before launching the decisive attack. De Maar said: "We were planning for a sprint but there was a bit of movement, I suddenly saw a gap and decided to keep on going. "I had a rough start to the Tour. I was involved in two crashes and I was thinking about going home. "I'd come to contend the general classification but lost four minutes in one stage. I lost motivation, but it looks like I have found it again." Howard said: "I'll be having a few problems up the climbs and I can't see myself still in the gold jersey by the end of the week but I'm going to try. "I knew Cavendish was struggling with the climbs early in the stage, so when the crunch came I knew he wasn't going to go. When the break happened, I just made sure I went with them." Garmin's Belgian rider Sep Vanmarcke took second place ahead of Dutchman Boy van Poppel of UnitedHealthcare. Stage six on Friday is from Welshpool to Caerphilly.